YouTube music will provide a re-imagined mobile app and brand new desktop player that are designed for music. It will also include remixes, covers, live versions as well as deep cuts fans can’t find anywhere else – from the biggest artists in the world to freshest voices breaking through. New and iconic videos from “God’s Plan” and “Havana” to “Thriller,” “Sledgehammer” and more. “YouTube Music search works even if fans don’t know exactly what they’re looking for… we’ll find it if they describe it (try ‘that hipster song with the whistling’) or give us some lyrics (try ‘I make money moves’),” the company states. 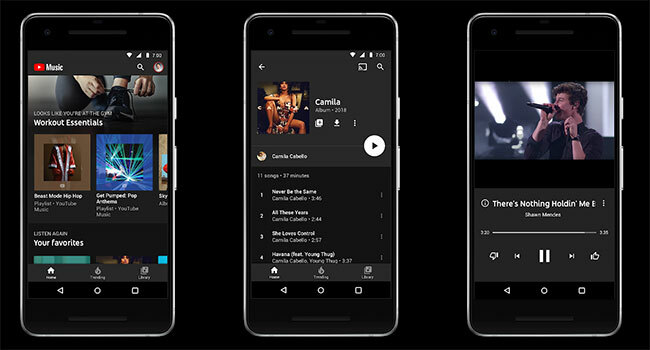 YouTube Music’s personalized home screen dynamically adapts to provide recommendations based on people’s listening history, where they are and what they’re doing. They’re algorithms will even recommend something relaxing before boarding your flight or suggest some upbeat tracks that will get your heart racing at the gym. The new service will provide thousands of playlists built to help fans discover new music no matter their tastes. Fans can enjoy the new ad-supported version of YouTube Music for free, or purchase a YouTube Music Premium membership for $9.99 per month that gives fans background listening, downloads and an ad-free experience. The company will also be renaming its current paid subscription service, YouTube Red, to YouTube Premium that will provide an ad-free experience with original programming, background and offline access. Each YouTube Premium membership will include YouTube Music for $11.99 per month for all new members. YouTube Music will be available for early access to customers in the U.S., Australia, New Zealand, Mexico and South Korea on May 22nd with it launching in Austria, Canada, Denmark, Finland, France, Germany, Ireland, Italy, Norway, Russia, Spain, Sweden, Switzerland and the United Kingdom in the coming weeks. No wide launch date has been announced as of press time. Fans can find out when it’s available in their area via YouTube’s website.